The Centre is not open at the weekends. 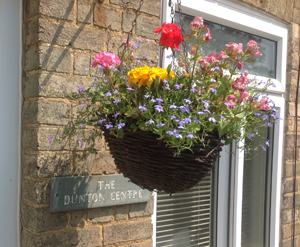 The Centre is located in a terraced cottage situated opposite the Church in Dunton, providing a peaceful rural environment. It is easily accessible by road (5 minutes from the A1) and is approximately 3 miles from Biggleswade and Ashwell stations, with a regular bus service from Biggleswade to Dunton. On-street parking is available before 4pm. After 4pm, Centre users are encouraged to park at Church Farm. There is a designated bay situated on the left just through the farm gates.Alternative parking is available adjacent to the pub,on the High Street, by the recycling bins.